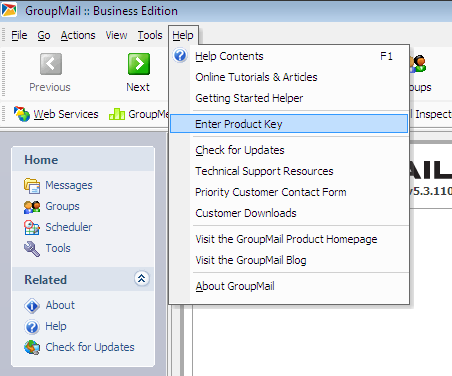 If for some reason, your new GroupMail Business Edition upgrade does not automatically overwrite the GroupMail Personal Edition that you already have installed on your computer, just open the Personal Edition and click Help/Enter Product Key and enter your new GroupMail Business Edition Product Key details (GM2-…) that were sent to you when you upgraded. If you continue to have problems after doing this, contact the GroupMail support team. They will be happy to help.